It is understandable that small business houses have a limited amount of budget for marketing the business. Most of the revenue they generate in their business has to be reinvested in the business and that too mostly in production, logistics, or in providing service. Thus, not much money is left with them which they can use for the purpose of marketing. However, the internet technology provides a number of options to the entrepreneurs with small scale businesses to promote themselves. One of the most lucrative tools that Internet Technology has given is 'Blog'. Writing a Blog is one of the most convenient ways for small scale business owners with which they can market their products effectively. Blogs have become tremendously popular and they are used by many for reaching out to the audiences they want. Businessmen have also understood the advantages of Blogging about the products and services related to their industry. How Do Blogs Help In Marketing? It is advisable that you take assistance of professional online marketing companies as they are well aware of the tools and techniques. These companies will surely help you get higher rankings in the search engines. 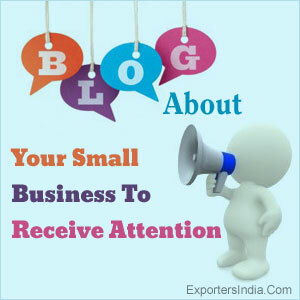 2 thoughts on "Blog About Your Small Business To Receive Attention"
Thanks a lot for providing individuals with a very wonderful chance to read in detail from this site. It really is very pleasing and jam-packed with fun for me and my \\office friends to visit your website on the least thrice a week to learn the newest secrets you have got.And lastly, I am usually fulfilled with the fantastic knowledge you serve.Certain 1 facts in this posting are undoubtedly the simplest I have had. I loved as much as you will receive carried out right here.\\The sketch is attractive, your authored material stylish.nonetheless, you command get got an edginess over that \\you wish be delivering the following. unwell unquestionably come further formerly again as exactly the same nearly very often inside case you shield this increase.